Below you will find links to our catalog in pdf format. Also, if you search our online database, search results will have links to the individual catalog pages relevant to search results for more detailed information of products. Those individual pages will load faster than an entire section and are more likely to be the most recent version of the catalog page. 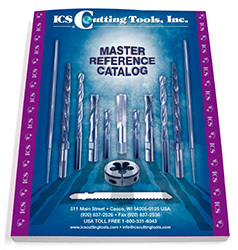 Please call us at 920-837-2526 or email us at info@icscuttingtools.com if you have any questions or comments. Online catalog prices may not be current. Last update for each section shown above. In some cases, prices in the catalog have been removed. Call 920-837-2526 for latest pricing. You may also search for individual products by using our online database.